I’ve always loved buying high quality, great smelling bath products. One day, I dream of having a great big bath tub so I can enjoy these products even more! I recently got to try out one of Vitabath’s Holiday Bath Sets and I am absolutely in love! From the bottles to the colors to the scents, I have found a new company that my daughter and I both enjoy! Vitabath sent me the Sweet Pink Peppermint set. I love the pretty pink colors but I loved the scent even more. The Sweet Pink Peppermint set smells like a mix of candy cane, vanilla & sugary musk. The set comes with a sulfate and paraben free moisturizing Body Wash and Hydrating Lotion. Each bottle is 16.9 fl oz and is a great price for $16.99. 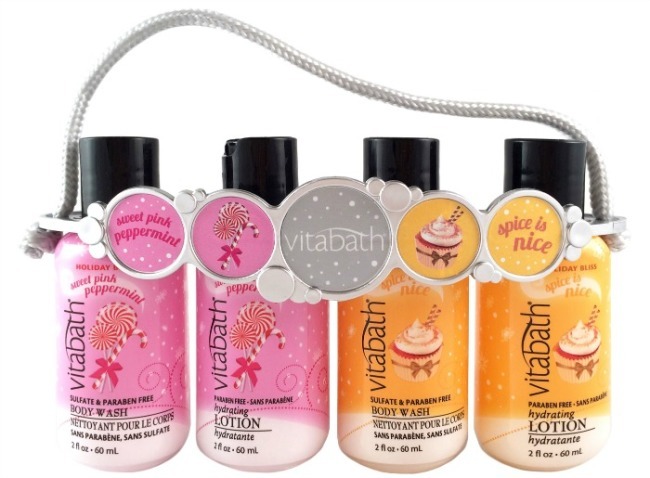 With great prices like these, Vitabath’s sets will make great Holiday Gifts for the people on your list. You can find Vitabath products at hundreds of retailers including Stage Stores, Bed Bath & Beyond, Walgreens, ULTA Beauty, Rite Aid, K-Mart, and gift and specialty stores. Vitabath has been trusted by consumers for more than 50 years because of it’s use of quality ingredients and wonderful fragrances. These fragrances indulge the senses and nourish the skin, resulting in a relaxing, yet invigorating, at-home spa experience. 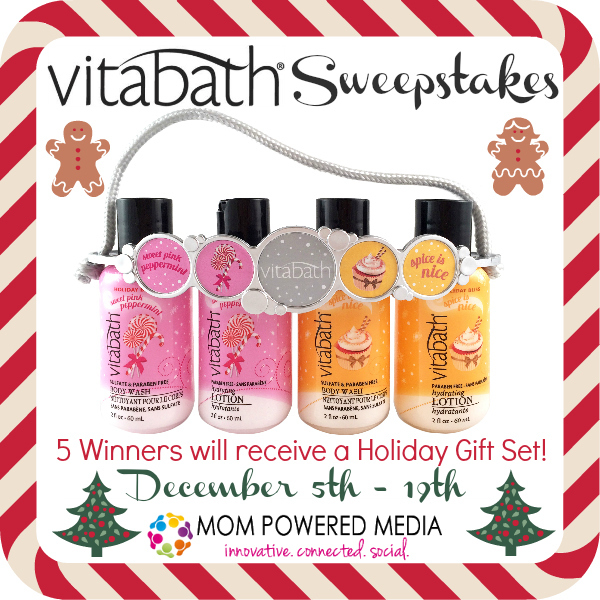 Five winners will receive the Vitabath Holiday Gift Set. Giveaway ends December 19th at 11:59pm, open to US residents, ages 18+. Only one entrant per household, per address. Winner is subject to eligibility verification. Enter using the giveaway form below. Good luck! I would love to have the Spice is Nice™ Body Wash & Lotion 16oz Set. I would love to have the Sweet Pink Peppermint body wash and lotion. Id love the spice is nice set. I like the Holiday body wash and lotion carrier. Id love to try the Sweet Pink Peppermint body wash and lotion because who doesn’t like the smell of peppermint! I would love to win the Fragrance Favorites Body Wash 4 Pack Travel Carrier – would really enjoy that! Refresh and renew for dry skin. I would love to have the Sweet Pink Peppermint set. Sweet Pink Peppermint™ Body Wash & Lotion 16oz Set if I won. I would try the spice is nice first. i think i would love to have the plus for dry skin set. i have really dry skin. I would love to try the Plus for Dry Skin™ Refresh & Renew Holiday Set or Sweet Pink Peppermint™ Body Wash & Lotion 16oz Set! Thank you! I like the spice is nice set. I would like to have the Sweet Pink Peppermint set. I’d choose the Spice is Nice holiday set. Love Vitabath. This would be a great stocking stuffer. I’d like the Spice is Nice Body Wash and Lotion 16oz set. I like the Sweet Pink Peppermint scent. I would like to try spice is nice. I like the Fresh Citrus Twist Essential Package. Sweet Pink Peppermint would be nice. I would like to try the Sweet Pink Peppermint set. I would love to have the Sweet Pink Peppermint. I would love the Spice is Nice Body Wash & Lotion 2013 Set. The sweet pink peppermint would smell yummy on my wife! I like the Sweet Pink Peppermint Body Wash & Lotion 2013 Set! I’d pick Sweet Pink Peppermint set. I like the Sweet Pink Peppermint™ Body Wash & Lotion 2013 Set. I would like to have the Spice is Nice™ set. I would like the Spice is nice set! The Plus for Dry Skin™ Refresh & Renew Holiday Set would be really nice to win. Thanks!